Growing catch crops after main crops is considered an important management practice for the resilience and long-term stability of agricultural cropping practices. Catch crops are non-profit crops planted a few weeks after the harvest of the main crop and before the next one is sown. This practice imitates the natural ecosystem by preserving soil nutrient resources such as nitrogen and phosphorous, increasing soil fertility and carbon sequestration, and reducing soil erosion. In Europe, catch crops are part of the second pillar of the Common Agricultural Policy (CAP), an agricultural subsidy system for farmers, where farmlands of more than 15 hectares generally have to designate 5% of the arable land as “ecological focus areas” in order to comply with the provision. Growing catch crops such as fodder radish, yellow mustard and different grasses are one way to live up to this requirement. EU regulations provides rules for the financing of CAP expenditure and for relevant management and control systems, requiring Member States to put an integrated administration and control system in place for the management of most of the EU agricultural spending. In Denmark, this is managed by the Danish Agricultural Agency (DAA), whose work involves many field-based controls and heavy administrative burdens. Agricultural monitoring using satellite-based information serves as an efficient supplement to monitoring efforts performed by national agencies. At DHI GRAS, we have completed several projects for the DAA with promising results. One of the major challenges to large area monitoring using satellite imagery is that the data is highly irregular in time. For example, any two fields in Denmark will have very different imagery available, due to different orbit overpass times over each field, and because of gaps caused by cloud cover. To solve this challenge, we developed innovative processing techniques so that all available cloud-free imagery over Denmark can be used seamlessly in machine learning algorithms that can accurately map catch crops. We tested a number of advanced machine learning and deep learning methods to optimize processing time and mapping accuracy – gathering valuable knowledge of current technological capabilities and which areas require further methodological development. 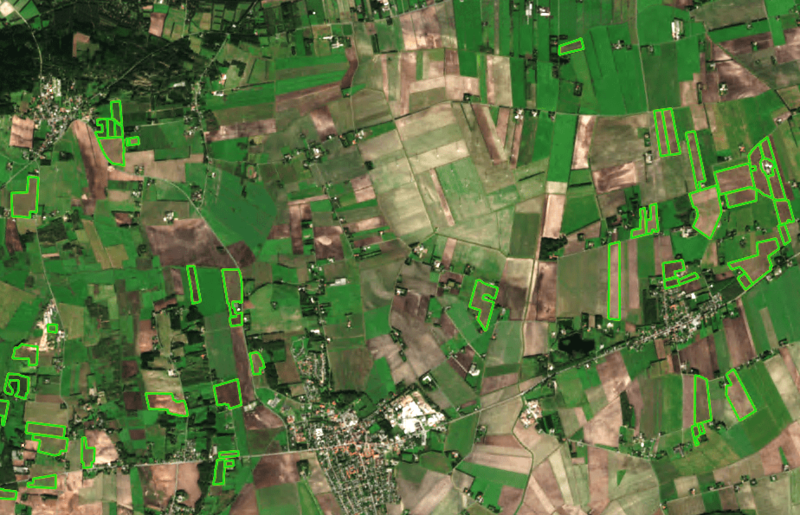 We’ve found great potential in using satellite imagery in connection with the agricultural industry especially for farmers, who can look forward to less paperwork and fewer control visits by the DAA. Although information from satellites cannot completely replace field visits, it can be used to indicate to the DAA where they should focus their field visits. By using satellites, we are taking a natural step towards the future of agricultural monitoring and are making the first experiences which over time will make it easier to live up to CAP regulations, both as a farmer and as a national agency.